PepsiCo committed last week to continue to strive for gender parity and economic empowerment of women around the world as well as increasing diversity in the company. It also committed to invest US$100 million, in partnership with the PepsiCo Foundation, to support initiatives that will benefit 12.5 million women and girls around the world with skills building and job readiness. Krista Pilot speaks at the Women In Leadership forum. Dubai, UAE: PepsiCo, the global food and beverage company, is committed to workforce diversity, including the economic empowerment of women in the MENA region and across the world. This has been a strong commitment throughout its history and a key goal over the next decade. 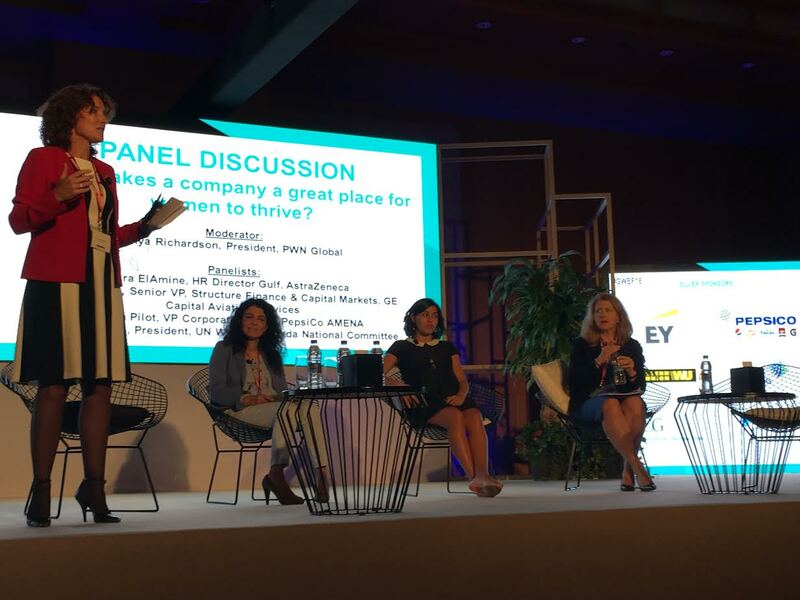 Speaking at the Women in Leadership (WIL) Economic Forum in Dubai, PepsiCo pledged to continue to drive diversity and inclusiveness to boost women’s participation in the workforce regionally and globally. Last week, PepsiCo announced its ‘2025 Sustainability Agenda’ which is designed to meet changing consumer and societal needs. As part of this agenda, PepsiCo will invest US$100 million in partnership with the PepsiCo Foundation to support initiatives that will benefit 12.5 million women and girls around the world. PepsiCo has pledged to continue developing a diverse, inclusive and engaged workforce, including a focus on achieving gender parity in the company’s management roles and pay equity for women. “We are pursuing new initiatives to promote diversity in our global workforce, support the advancement of women, and spur social and economic development in communities around the world. The Women in Leadership (WIL) Economic Forum is a stage to help us outline how PepsiCo, globally and regionally, is championing workforce diversity and to learn from others about how women can be integrated effectively in business. “Globally, PepsiCo values diversity as a powerful driver for business performance. Placing women at the heart of the workforce globally, as well as here in the region, is key to our diversity and talent strategy. Our thinking is aligned with the United Nations’ Strategic Development Goals which urge the participation of women globally in political, economic and public life,” said Krista Pilot, Vice-President, Corporate Affairs, PepsiCo, Asia, Middle East and North Africa. PepsiCo’s efforts extend to the community through various programmes. PepsiCo runs several skills and training programmes for women and young people in the region. Among these programs is the Hadafi (My Goal) Women Entrepreneurship Programme which provides funding, training and mentorship for Arab women who have started their own firms or who are aspiring to be entrepreneurs. PepsiCo’s women executives also support and provide mentorship to help Arab women to succeed across numerous other partnerships centered around skills-building such as the partnership with the Arab International Women’s Forum (AIWF) aimed at empowering Arab women. In Lebanon, 90 students have graduated from our ‘Skills for Success’ programme, in partnership with AMIDEAST, after receiving finance, IT literacy and English language courses to improve their job readiness. Through the PepsiCo ‘Tomooh’ education programme in upper Egypt, PepsiCo has helped young girls from low income communities to access education. In Jordan and Lebanon, Tomooh provides university-level scholarships, in partnership with Ajialouna and the Jordanian Hashemite Fund for Human Development, enabling them to start or complete their education. PepsiCo’s progress on diversity and inclusion has been achieved under ‘Performance with Purpose’, a vision launched in 2006 and rooted in the fundamental belief that business success is inextricably linked to the sustainability of the world we share. As part of the ‘2025 Sustainability Agenda’, PepsiCo will foster continued business growth in a way that responds to changing consumer and societal needs. At the heart of PepsiCo is Performance with Purpose – our fundamental belief that the success of our company is inextricably linked to the sustainability of the world around. We believe that continuously improving the products we sell, operating responsibly to protect our planet and empowering people around the world is what enables PepsiCo to run a successful global company that creates long-term value for society and our shareholders. The Women In Leadership Economic Forum brings together up to 500 global men and women business leaders, policy-makers, young female professionals and entrepreneurs. They gather to dissect the challenge of diversity, share experiences and produce actionable strategies to strive for women’s economic empowerment. Endorsed by the UAE Ministry of Economy, the Forum has championed the recognition of women as key economic drivers for over a decade. It aims to highlight inspiring stories of successful women and best practices from organizations that are leading the way.